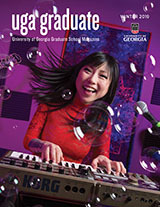 Application materials are reviewed by the Graduate School and the academic department. The Graduate School reviews the department’s recommendation and makes the final determination on acceptance. Applicants must be admitted to the Graduate School before they are eligible to register. Official acceptance is conveyed to the applicant in a formal letter issued by the Office of Graduate Admissions. Admission is granted for a specific semester and is validated by registration for that semester.